"When you see mountains, remember - they can be moved." How often does losing weight and "getting healthy" seem impossible? I can't remember how many times I tried and failed to make lasting changes in my life with regard to health and weight. That is until I discovered Take Shape For Life. Take Shape For Life is not a diet. It is a way of overhauling your way of life. See, I knew that my way of life had created a problem that needed fixing, and that another diet was not the solution. By forging new habits, I've been able to reorient my way of life toward optimal health and longevity. In other words, mountains have been moved. Has your way of life created a weight problem you need to address? Have you tried and failed to lose weight and keep it off? Is your weight causing other problems with your health? Do you have mountains you'd like to move? I am a FREE Health Coach with Take Shape For Life, and if you're coachable, I can help. Contact me, and let's reorient your way of life toward optimal health and longevity. Be inspired, and never forget that mountains can be moved. Continuing with the whole explorer/navigator theme, consider what may have become of Cortez or Columbus if they had been off by a few degrees when they embarked on their voyages? When sailing, one is constantly checking and re-checking the ship's heading, making course corrections all along the way. Where might they have ended up if they had gotten lazy or sloppy? What would the world map look like today if Columbus landed in Newfoundland or Brazil instead of the Bahamas? Our world might be a different place. Sometimes it's difficult to tell what kind of progress we're making with regard to weight loss and health. 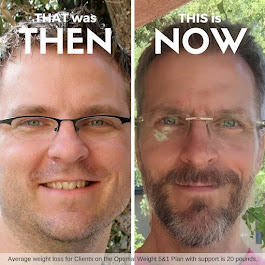 I know in my own life there have been many times where I've hit a plateau, or even gone up a pound or two (or five), and I start to ask questions: "So what? Is it really that important? I don't feel all that different - it's not like I'm sick or anything. Does it really matter how much I weigh?" At moments like these, I need to make a mental course correction and reorient myself toward health. Because YES, it matters! Mental course corrections, made repeatedly over time, result in physical course corrections: every pound lost, every inch of body measurement, every dress size - each of these is a degree of physical course correction that may seem trivial now, but is going to pay off big time later on in life (even now, your body is thanking you as inflammation subsides, blood pressure reduces, insulin stabilizes, and pressure on joints starts to lift). Sometimes you're just a degree off your heading, and the course correction is a minor one; sometimes you've let yourself drift, and have to do a 180. In any case, these course corrections - made daily if necessary - are what will ensure you maintain your heading toward optimal health. What's your bearing? Where's your head at? How's your body? Are you healthy, sick, or somewhere in between? Are you pointed in the right direction? That all depends on your goals I suppose, but if your goals include things like health and longevity, then the direction you're headed today makes all the difference in the world. The journey is long, and is bound to pass through troubled waters, unexpected storms, and for many, uncharted territory. Check your heading, and correct your course. Someday soon, you'll discover a new world of optimal health. Want to orient yourself toward optimal health but not sure where to turn? I am a FREE Certified Health Coach with Take Shape For Life, and I can help you find your way! Contact me, and let's get you headed in the right direction. When starting out on the journey to lose weight and create health, one of the first things we ought to do is take a "before" picture. As in, "this was me before I started losing weight." Yet a lot of folks don't want to do it. Why is that? Okay, I'll be the first to admit: it's not fun standing in front of a camera when you're thick. It just isn't. I can't remember how many times I plastered on a smile and said Cheese! for the camera when I was overweight. And that was at family functions and other events where the photo was pretty much an obligation. I would do all I could to make myself look small. "If I crane my neck and hold this angle, maybe the camera won't pick up my multi-chin" or "I'll just hide behind so-and-so, so nobody can see the gut." Easy to do when you're 6'3". You shorties out there have my sympathy. But actually posing for a picture, the purpose of which is to accurately expose one's present physical condition? Yikes! It is critical that you do this. I can't emphasize this enough. The photo marks the pivot point in your life, the moment when everything changed. You're saying, if only to yourself, "I am committing to this process, I am going to make this life change, I am going on this journey, and THIS is where I started." It marks the day you drew a line in the sand. Then, if you're feeling brave, post it up on your home page, and make that commitment public. Scary? Heck yeah! But you will be amazed at the outpouring of support, sometimes from complete strangers, as you venture forth. Someday you'll look at that picture and remember "Yup, that was me. That's where I came from. That's where I started. And I am never going back there again." If you've been longing to lose weight and get healthy, but don't know where to start, I can help. I am a FREE Certified Health Coach with Take Shape For Life, and my mission is to help people create health in their lives. Find out more here, or email me directly at DavidJamesPhillips@Gmail.com. Grit (noun): the tendency to work strenuously toward challenges, maintaining effort and interest over years despite failure, adversity, and plateaus in progress. (Charles Duhigg, The Power of Habit). Most of us think we have grit. Certainly we can recognize its value when it comes to the pursuit of personal accomplishments and, well, anything else worth having. But once in a while it's good to look outside of ourselves to see what Grit looks like from someone else's perspective. Enter Peter Kraft Sr. (age 50) and Peter Kraft Jr. (age 20), from Gainesville, FL. This father & son team just finished the Tour Divide, but not before it nearly finished them. The Tour Divide is a grassroots mountain bike race tour that begins in Banff, Canada, and follows the continental divide to the Mexican border. 2700+ miles, and over 200,000 feet in elevation (i.e. climbing). Anyone who finishes this non-race has some considerable measure of grit. This year's event began on June 14th. The guy who finished first, Mike Hall, did it in less than 15 days. Forest Baker and Eric Foster are going for the so-called triple crown of endurance mountain biking: having already completed the Arizona Trail Race in April, they've finished the Tour Divide, and are now headed to the starting line of the Colorado Trail Race, which starts on July 21st. Peter Kraft Sr. & Jr? They rolled up to the Mexican border last night around 9 p.m., 31 days after they left Banff. Not exactly a course record. Consider that these two have been preparing for this event for three years. Anyone who makes it to the starting line deserves a medal, and these two lined up in Banff with the rest of the pack. Then they rode for 2000+ miles to New Mexico, where disaster struck. First, Kraft Sr. crashed. Kraft Jr. accompanies Sr. in the ambulance for the hour-plus ride to the hospital, where Sr. is stitched back up. Then, they hitch a ride back to the course, get back on the bikes, and they KEEP GOING. Then, Kraft Jr. gets violently ill. Throwing-up-all-night ill. In the middle of nowhere. They find a park ranger, who assesses the damage and tells them they're in trouble. Another ambulance ride to another hospital. At this point, I'm almost hoping they throw in the towel. "It's been a heck of a ride boys. You've earned your battle scars. Now go on home and lick your wounds." The go back to the course. They get back on the bikes. And they finish the race. Off the charts. They ought to make a movie about these two. Well done Krafts. Whenever I think about bailing on, well, anything, I'm gonna remember the name Kraft, and think again. When Cortez reached the new world, he burned his ships to ensure he and his crew could not go back the way they came. Onward! I burned a little ship of my own the other day. Okay, maybe not a "ship" per se - more like a dinghy. We just returned home from family vacation in Carlsbad, our annual week at the beach. It was bliss. However, vacations can pose a challenge when it comes to making productive eating decisions. Different sights, different people, different kitchen. All of these "differents" can throw the routine off, if you know what I mean. Let's just say not all my decisions were productive ones in light of my health goals. Nothing major, but enough to make me start to question my ability to maintain for the long term. When we returned home, I was reminded of where I was a couple years ago. As I unpacked, I found my old swimming trunks tucked away in a drawer. My "big daddy" trunks. 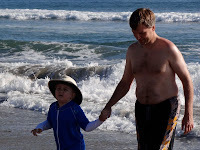 For years, I've had two pairs of swimming trunks: my "fit daddy" goal trunks, and my "big daddy" trunks. In the past, I'd take both pairs on vacation, hoping against hope that I could get the fit daddy trunks up past my rump. I would try, then abandon the effort, break out the big daddy's, sigh as I slipped them on, then pretend I wasn't embarrassed to go outside without a shirt. Yup, there they are. Don't melt your retinas. Last year was the first year I was actually able to get the "fit daddy" trunks on. This year, I didn't even pack the "big daddy" trunks. When we got home, there they were. See, I've kept them around, just in case. Just in case it all goes to pot. Just in case I throw it all away and blow up again. Just in case I get selfish and lazy again, and decide that instant gratification is more important than fitness and longevity. Arguably, shredding a pair of shorts may be a small milestone to some (I've seen my formidable wife Stacy dispose of yard-bags filled with old "big girl" clothes). But it was a big deal to me. Do you have a ship you wish you could burn? Any "big boy" clothes you wish you could give away? I can help! I am a Certified Health Coach with Take Shape For Life, and I can help you achieve your health goals. Hey, life is too short to pretend to not be embarrassed at the beach. Join me, and let's move forward together. People say change is hard. But the hardest part of change is not the change itself, but recognizing that it’s necessary. Somehow, we need to realize that we’re oblivious or in denial about certain aspects of our lives, and acknowledge that we alone are responsible to actually do something about it. Outside Magazine recently published an article titled "YOU'RE DELUSIONAL ABOUT YOUR HEALTH." Subtle, but it hits close to home. I was at a conference during my "thick" years, and one of the attendees and I sported remarkably similar hairstyles. Naturally I thought I rocked it and that he didn't, in particular because I viewed him as "thick" and myself as, well, less thick. Fine, I viewed myself as svelte, and gloated to myself about how lean & mean I looked. A month later I received the quarterly newsletter from the conference sponsor, and there on the cover was a photo of me and the other similarly coiffed dude. And we looked the same. Same hair, same gut, same chins (yes, more than one each). The. Same. If anything, I was the thick one. Talk about deluded. We train ourselves to see our bodies in a certain way. We think, “Oh, I’m not that thick.” Really? Then we catch ourselves off guard and get a glimpse of the truth. Ever been tagged in a candid photo on Facebook and not recognize yourself? Ever catch a reflection in a window or a mirror as you round a corner at the mall? Who is that person? We become desensitized to our own condition. Like the “cat lady” who lives alone because she can no longer smell the dozen-plus felines that keep her company, we become desensitized to our physical condition. We simply get used to it. Admitting we have a problem is the first step to recovery, right? So let’s say you have a vague notion of the truth about yourself, but you don’t really know what to do. How does one create health? For a long time after my delusion shattered, I had no clue. All I knew was that something had to change. I just didn’t know what, or how, or… anything. So for a long time, I did nothing. And you know what I found? If you don’t change anything, nothing changes. Hoping and wishing and pining and dreaming for change doesn’t get the job done. It’s not until we actually do something about the problem that things stand a chance of turning around. So if you want optimal health in your life but you don't know how to create it, chances are you're probably not doing anything intentional about it. Hey, there’s good news: you’ve already nailed the hard part, realizing the need to change. If all you lack is the tools, then I’m your guy. I have been where you are now, and I’m telling you it’s possible. Once we have the tools to make the change, the change itself is not that difficult. I’m a Health Coach with Take Shape For Life, and I can help. Contact me, and let’s make the change. “It's never too late to be what you might have been.” –George Elliot. When was the last time you had it? High school? College? Remember what it was like? How good it felt? I am speaking of course about a fit & healthy body. For me it was high school. I was chubby growing up. Lots of hoodies and baggy jeans. Then in high school I started to stretch out. I dabbled with wrestling, cross country, and cycling. Then in 11th grade I got involved with a recreational gymnastics class at a local club. Nothing competitive, but I was there 3-4 time per week, working out and having fun. Best shape of my life. We get to a certain age and we start to let go of those ideas we once had for ourselves. We accept the loss. Why is that? Old habits that won't die? Too much history going away from an ideal? We've taught ourselves that because we've spent so many years going one direction, it's too hard to turn around now; we've learned that because it hasn't happened yet, it's probably not gonna happen any time soon, if ever. We just happen to be wrong. What would you think if I suggested that the best shape of your life was in fact ahead of you, not behind you? Seem daunting? Impossible? Fantasy? Not on your life! I'm here to tell you it is possible to turn the ship around. Okay, full disclosure. I'm not there yet, not by a long shot. I still have goals I'm pursuing with regard to musculature and endurance capacity. What I can tell you is that I weigh less now than I did when I graduated from high school. The difference is, now I know my goal, and I know what I need to do to make it happen. If you've accepted the loss of an idea you once had of yourself, a "you" you once believed was possible, contact me. I'm a Health Coach with Take Shape For Life, and I'm telling you it is possible to turn it around. In fact, it's not that complicated. Heck, I did it. You can too.